Pacific Island Nation Sues U.S., Others For Violating Nuclear Treaty : The Two-Way The Marshall Islands, the site of 66 U.S. nuclear weapons tests between 1946 and 1958, says the Non-Proliferation Treaty requires nuclear states to disarm. 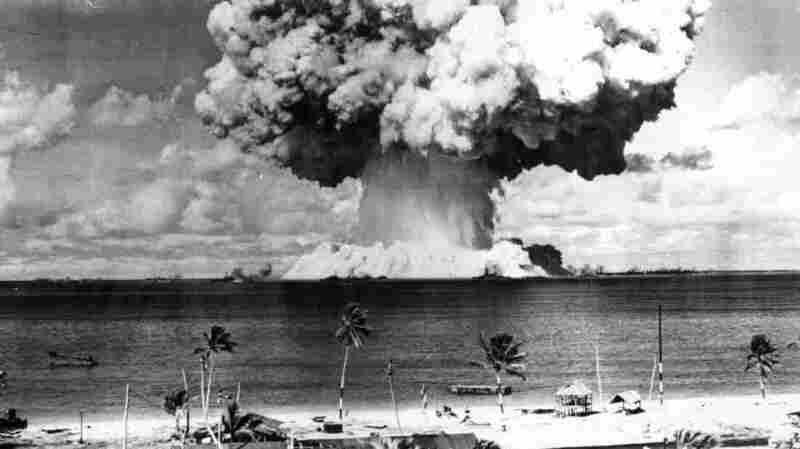 The second atomic bomb test at Bikini Atoll on July 25, 1946. The Marshall Islands, where Bikini is located, is suing the U.S. for what it calls a violation of the Nuclear Non-Proliferation Treaty. The Marshall Islands, the Pacific chain where the U.S. carried out dozens of nuclear tests in the late 1940s and 1950s, has filed suit in the Hague against Washington and the governments of eight other countries it says have not lived up to the Nuclear Non-Proliferation Treaty. The Guardian says that in the "unprecedented legal action," brought before the International Court of Justice on Thursday, "the Republic of the Marshall Islands accuses the nuclear weapons states of a 'flagrant denial of human justice.' It argues it is justified in taking the action because of the harm it suffered as a result of the nuclear arms race." Besides the U.S., the Marshall Islands is also suing Russia, China, France and the U.K., which have all signed the Non-Proliferation Treaty, or NPT, as well as four other countries that have never signed — India, Pakistan, North Korea and Israel, which has never acknowledged possessing nuclear weapons. In court documents, the Marshall Islands argues that the 1968 NPT, which did not come into force until 1970, amounts to a compact between nuclear haves and have-nots. Non-weapons states essentially agreed not to try to acquire nuclear weapons in exchange for weapons states moving toward disarmament, the Marshalls says. "Although the size of the arsenals are sharply down from the height of the cold war, the Marshall Islands' legal case notes there remain more than 17,000 warheads in existence, 16,000 of them owned by Russia and the US – enough to destroy all life on the planet." The Marshalls were the site of 66 nuclear tests from 1946 to 1958, including the first thermonuclear weapon in 1952 and, two years later, the highest-yielding test ever conducted by the U.S., code-named Castle Bravo, which was equivalent to 1,000 Hiroshima bombs. Although islanders were relocated from Bikini and Eniwetok atolls — ground zero for the majority of the tests — three other Marshall atolls underwent emergency evacuations in 1954 after they were unexpectedly exposed to radioactive fallout. The Marshallese say they've suffered serious health issues ever since. The Marshall Islands were governed by the U.S. until 1979 and won full independence in 1986. The suit is not seeking compensation but asks the court to require the nine nuclear states to meet their obligations. "There hasn't been a case where individual governments are saying to the nuclear states, 'You are not complying with your disarmament obligations,' " John Burroughs, executive director of the New York-based Lawyers Committee on Nuclear Policy, part of the international pro bono legal team, tells The Associated Press. According to Burroughs, in 1996 the International Court of Justice said unanimously that an obligation existed to bring the disarmament negotiations to a conclusion but instead "progress towards disarmament has essentially been stalemated."